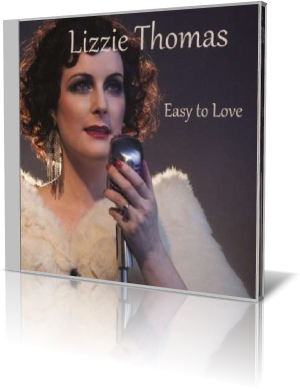 Jazz vocals in the tradition of old-school divas is what you get with Easy to Love (2013) by Lizzie Thomas. It’s a set of 10 standards, including a few that are slightly off the beaten path. A variable ensemble of musicians assists Thomas. For most tracks, she’s accompanied by pianist Xavier Davis, trumpeter Antoine Drye, guitarist Ron Affif and bassist Yoshi Waki. Appearing on selected tracks are Janelle Reichman, clarinet; Greg Ryan, bass; Frank Lacy, trombone; and Anne Drummond, flute. Drum duties are split between Frank Levatino and Alvester Garnett. “Close Your Eyes” is a delightful ballad. Balance between voice and instruments is superb. Thomas charms with her singing while the musicians provide plenty of ambience. Waki, Davis and Garnett maintain the pace behind solos by Affif and Drye. Thomas comes back for the finale, delivering the lines with verve before closing with a fade stop. An up-tempo waltz is the rhythm for “Just the Way You Look Tonight.” Reichman, Drye and Lacy provide horn section fills during the early verses. Reichman delivers a clarinet solo similar to what one might expect from Benny Goodman. Davis and Lacy inject their own touches. Thomas also takes on the classics “One Note Samba,” “I only Have Eyes for You,” “You Stepped Out of a Dream” and “Our Love Is Here to Stay.” It’s easy for a vocalist who does these songs to get lost in the shuffle. However, individuality and fresh arrangements help Thomas avoid that trap. Thomas began studying classical piano at the age of 8, clarinet at 10 and discovered her voice at 13. She studied jazz vocals at Belmont University in Nashville, Tennessee. After graduating with a bachelor of arts degree in vocal jazz performance, she experimented with indie alternative bands as a keyboardist and songwriter. Easy to Love is Thomas’ second album as a leader.